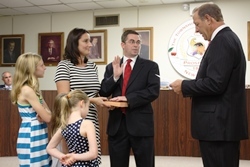 Township resident Brian Bauerle was sworn in last night as the newest member of Cherry Hill's Township Council. His appointment came during a special meeting to fill the seat that became vacant with the passing of longtime Councilman N. John Amato in late September. Councilman Bauerle is a father of three and a Knollwood resident and is active throughout the community, as a volunteer youth soccer coach, a member of the Board of the Cherry Hill Soccer Club, and as a member of the Barclay Farm Swim Club. He and his wife are also actively involved in activities with their three daughters, who attend Kilmer Elementary School. Brian has been involved in our community in so many ways, and he embodies many of the characteristics that made his predecessor, Councilman Amato, so beloved in our community -- he shares our commitment to strong, vibrant neighborhoods and a fiscally responsible government, and I know he will serve the residents of Cherry Hill to the best of his ability. Please join me in congratulating Councilman Bauerle on his appointment. Click here to read more. The Camden County Department of Public Works is scheduled to begin repaving Springdale Road between Kresson Road and Exton Circle/Wilderness Drive on Monday, Oct. 6. All southbound traffic will be detoured from 8:30 a.m. to 6:30 p.m. daily. Northbound traffic will continue to flow uninterrupted during the project. The exact timing of the project is dependent upon weather and other factors. Delays are expected while detours are in place; motorists should allow extra time to reach their destination and use caution when traveling through the work zone. Click here for additional information. Learn all about what makes Cherry Hill such a great place to live, work and play at our second Welcome to Cherry Hill Night, from 6-8 p.m. Wednesday, Oct. 15 at the Cherry Hill Public Library. Meet me and members of Township Council, mingle with your neighbors, and learn about Township services and community activities. While you're there, enjoy a complimentary Taste of Cherry Hill from several local restaurants and stores, including the Capital Grille, Kaminski's, Java City Coffee, Seasons 52, ShopRite and Wegmans. There will be children's activities and the Cherry Hill Police Department will host its Kid Card ID program throughout the night. Registration is encouraged, but not required. Questions? Call my office at (856) 488-7878, or e-mail Donna Dovey at ddovey@chtownship.com. Click here for more information; click here to RSVP. Photographers of all ages and abilities are encouraged to enter their original pieces to our juried photography exhibit, which will be on display during the Township's annual Fall into the Arts celebration, Oct. 11 to 26 at the Croft Farm Arts Center. The Call for Entries will take place in the Arts Center from 4-7 p.m. Wednesday, Oct. 8. There is a non-refundable, $10 jurying fee per piece; 3 pieces may be submitted per photographer. For guidelines and more information, e-mail Arts@chtownship.com. Fall into the Arts kicks off with our Meet the Artists Reception at 6 p.m. Friday, Oct. 11, and includes several other great family-oriented and cultural events, including Harvest Festival, an Ensemble Concert, and the Best of the Garden State Film Festival. Look for additional information on all of these exciting events in the coming weeks! For more information on Fall into the Arts or any related event, visit the Cherry Hill Arts Board blog, or click here. Explore a piece of Cherry Hill's history with free, guided tours of historic Barclay Farmstead, from noon to 4 p.m. this Sunday, Oct. 5. Presented by the Friends of Barclay Farmstead, this month's tour will include a free craft activity from 1 to 3 p.m., where guests can make their own beeswax candle. Beeswax, made by honeybees, was one of the earliest materials used to make candles, dating back to Roman times. Beeswax candles burn slower, cleaner, and smell more pleasant than candles made from tallow or paraffin. Can't make it this weekend? The Farmstead will be open for tours on the first Sunday in November, as well. Tours are free for Cherry Hill residents. For more information, call (856) 795-6225, or email info@barclayfarmstead.org. Be sure to follow @HistoricBarclay on Twitter, and the Barclay Farmstead Museum on Facebook for information on upcoming events and activities throughout the year. Spreadsheet programs were developed to replace columnar pads. Learn why to use spreadsheet programs like Microsoft Excel, OpenOffice Calc and LibreOffice Calc, which are both free programs. In Part I of this 4-part course, learn how to organize and store data such as telephone numbers, addresses and credit-card information, how to use the built-in spreadsheet help information, and how to use spreadsheets in the workplace. Prerequisites: Basic Mouse and Keyboard Skills, some PC experience, or equivalent experience. Seating is limited; click here to register. Join us for this new four-week series introducing a new language. This October, let's learn Spanish together. We'll meet once a week to practice our new vocabulary with bilingual stories, songs and more! Remember to sign up for each week in the series. Click here to reserve a spot. The Absolute True, Totally Not Made Up Stories That Actually Happened in New Jersey: Join local author Russell Roberts as he tells true tales about people, places and things that happened in New Jersey history. You won't believe it - and you won't look at the state the same way again! Learn new techniques and delve deeper into some others that we have touched on before. Great for beginners, as well as those students who have attended the previous classes. Head into the holiday season grounded and relaxed! To register for this event, visit www.kennedyhealth.org, or call (800) KHS-9004 and select option #3 to register by phone. Meet local people who love poetry as much as you do. Inspiring discussions about poetry and poetic forms and styles provide an opportunity to read aloud and discuss poems - one's own, or another's. With new topics every month, participants explore this literary art and learn from each other. Listeners are always welcome! Join countless libraries throughout the country for National Star Wars Reads Day. Drop by Youth Services between 2:30 and 4 p.m. for Star Wars-inspired crafts, snacks, and Lego build. Costumes are encouraged! Are you looking for ways to preserve your e-mail, photos and other digital memories? Come hear Dr. Donald T. Hawkins as he discusses the growing importance and awareness of personal digital information, how to preserve digital information, archive emails, legal issues related to your digital information, and commercial services that are available. Dr. Hawkins will sell copies of his book, "Personal Archiving: Preserving our Digital Heritage," and demonstrate how to digitize photos. This free special event is sponsored by the Cherry Hill Historical Commission, and will take place at 7 p.m. Tuesday, Oct. 7, in the Cherry Hill Library's lower-level conference center. For more information, call (856) 488-7886, or e-mail CHHC@chtownship.com. This Thursday, Oct. 9, the Cherry Hill Alliance presents a special screening of "Short Term 12," an emphatic, revealing drama that pulls audiences into the perspective of neglected youths. The film depicts the struggles of a compassionate 20-something contending with some unexpected life developments while working as a supervisor at a home for at-risk teens. This screening is part of the Alliance's Cinematic Reflections series and will begin with a discussion at 6:30, followed by the movie at 7. The event is presented by the Alliance, in cooperation with the Ombudsman for Disabled Citizens and the Governor's Council on Alcoholism and Drug Abuse. For more information or to RSVP, call (856) 488-7889, or e-mail Alliance@chtownship.com. Cherry Hill Education Foundation's "Cherry Hill-opoly" makes a great keepsake! The Cherry Hill Education Foundation has created a new board game called "Cherry Hill-opoly"! The game will showcase the Township of Cherry Hill and the Cherry Hill Public Schools in the traditional Monopoly format that we all know and love. All proceeds will be used by the Foundation to fund grants that will benefit Cherry Hill Schools. Games are $40 each. You can order online at www.CherryHillEducationFoundation.com, or complete the order form on the foundation's website and return it as soon as possible. Games ordered by Oct. 15 are guaranteed to be delivered in time for the December holidays. Don't miss the chance to own what is sure to become a treasured keepsake! Click here for more information or to order. On Tuesday night, several Cherry Hill residents turned out to learn how to prepare for emergencies of any kind during a special National Preparedness Month event in the Township's N. John Amato Council Chambers. Led by Cherry Hill Emergency Management Kevin Seta, the event was part of America's PrepareAthon 2014, a nationwide initiative aimed at raising awareness of the importance of preparing. It capped off Cherry Hill's observance of National Preparedness Month 2014, and featured tips on staying information in the event of an emergency, how families can prepare their own emergency plans, and what you should pack in your "Go Kit" of supplies you keep on hand for emergencies. If you couldn't make it to Tuesday's event, don't worry: You can visit Ready.gov any time to learn more about how to keep your family safe all year long. To reach Officer Seta and the Cherry Hill OEM, email kseta@cherryhillpolice.com, or call (856) 432-8836. This busy fall season has led to some scheduling conflicts and Sustainable Cherry Hill has announced that its Oct. 8 event has been postponed. Look for several informative blog posts at SustainableCherryHill.org in the coming weeks about installing and purchasing solar energy, staying comfortable during each season with improved energy efficiency and reduced costs, opportunities to capture incentive funding and understand energy-saving opportunities, and how your savings can translate into helping cut your carbon footprint. Do you have an event or topic idea for Sustainable Cherry Hill's Green Building/Business task force? Whether residential or business, your thoughts are welcome. Contact Scott Downie, ScottD@spiezle.com or Brenda Jorett, brenda@brendajorett.com. On Wednesday night, the Cherry Hill Board of Fire Commissioners formally appointed Thomas Kolbe to the position of Chief of the Cherry Hill Fire Department. Chief Kolbe was sworn in in front of family, friends, fellow fire officers, firefighters and Township officials, and his son, firefighter Christopher Kolbe, assisted in his badge pinning. Chief Kolbe is a veteran of the CHFD, and has been a full-time firefighter for 29 years. His career began as a volunteer firefighter in Cherry Hill in 1977, when he was just 16. Please join me in congratulating Chief Kolbe on his achievement. For pictures and more information, click here. The Cherry Hill Fire Department will continue its 2014 Smoke Alarm Campaign this weekend in Windsor Park and Surrey Place. Click here for more information. October is Fire Prevention Month, and the Cherry Hill Fire Department is kicking off a month of education and awareness with open houses at several fire stations in the Township. These events are an opportunity for Cherry Hill residents to visit their neighborhood fire house, speak with firefighters and EMTs, get an up-close look at the apparatus and equipment, and receive critical fire-safety information. Open houses are scheduled from 6:30 to 8 p.m. Tuesday, Oct. 7, at Station 3 (1100 Marlkress Road) and Station 6 (1501 Burnt Mill Road), and on Thursday, Oct. 9, at Station 24 (807 Route 70 West), Station 22 (951 Kings Highway North) and Station 5 (2328 Route 38). For more information, visit the Cherry Hill Fire Department's Facebook page. 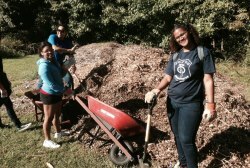 Last Saturday, more than a dozen Cherry Hill residents volunteered their time to help beautiful our local public lands as part of National Public Lands Day 2014. Led by the Cherry Hill Environmental Board and the Cherry Hill Trail Crew, our volunteers completed a number of projects in and around historic Croft Farm and on our various Township trails. Projects included clearing a red trail on the Bunker Hill Trail network, wood chipping on the Croft Farm Nature Trail, replacing trail markers, and mounting a display case at the Downs Farm Trail kiosk. The volunteers' willingness to come out to help beautify and preserve our local natural resources is an example for all of us, and a great example of why Cherry Hill is a great place to live, work and play. Thank you to CHEB, the Trail Crew and all of our volunteers for their hard work and dedication. Join the Camden County Board of Freeholders and the Camden County Animal Shelter on Saturday, Oct. 12, for a fun-packed day of contests, games, and a walk to pledge money to benefit the animals of the Camden County Animal Shelter. Click here for more information. [http://www.cherryhill-nj.com/CivicAlerts.aspx?AID=600] The Camden County Department of Public Works is scheduled to begin repaving Springdale Road between Kresson Road and Exton Circle/Wilderness Drive on Monday, Oct. 6. All southbound traffic will be detoured from 8:30 a.m. to 6:30 p.m. daily. Northbound traffic will continue to flow uninterrupted during the project. The exact timing of the project is dependent upon weather and other factors. Delays are expected while detours are in place; motorists should allow extra time to reach their destination and use caution when traveling through the work zone. Click here for additional information [http://www.cherryhill-nj.com/CivicAlerts.aspx?AID=601] . Learn all about what makes Cherry Hill such a great place to live, work and play at our second Welcome to Cherry Hill Night, from 6-8 p.m. Wednesday, Oct. 15 at the Cherry Hill Public Library. Meet me and members of Township Council, mingle with your neighbors, and learn about Township services and community activities. While you're there, enjoy a complimentary Taste of Cherry Hill from several local restaurants and stores, including the Capital Grille, Kaminski's, Java City Coffee, Seasons 52, ShopRite and Wegmans. There will be children's activities and the Cherry Hill Police Department will host its Kid Card ID program throughout the night. Registration is encouraged, but not required. Questions? Call my office at (856) 488-7878, or e-mail Donna Dovey at ddovey@chtownship.com. 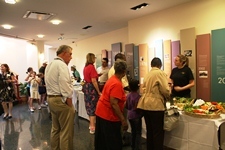 Click here [http://www.cherryhill-nj.com/index.aspx?NID=769] for more information; click here [http://www.cherryhill-nj.com/FormCenter/Events-5/RSVPWelcom-to-Cherry-Hill-Event-36] to RSVP. Photographers of all ages and abilities are encouraged to enter their original pieces to our juried photography exhibit, which will be on display during the Township's annual Fall into the Arts celebration, Oct. 11 to 26 at the Croft Farm Arts Center. The Call for Entries will take place in the Arts Center from 4-7 p.m. Wednesday, Oct. 8. There is a non-refundable, $10 jurying fee per piece; 3 pieces may be submitted per photographer. For guidelines and more information, e-mail Arts@chtownship.com. Fall into the Arts kicks off with our Meet the Artists Reception at 6 p.m. Friday, Oct. 11, and includes several other great family-oriented and cultural events, including Harvest Festival, an Ensemble Concert, and the Best of the Garden State Film Festival. Look for additional information on all of these exciting events in the coming weeks! For more information on Fall into the Arts or any related event, visit the Cherry Hill Arts Board blog [http://cherryhillarts.blogspot.com/] , or click here [http://www.cherryhill-nj.com/CivicAlerts.aspx?AID=602] . Explore a piece of Cherry Hill's history with free, guided tours of historic Barclay Farmstead, from noon to 4 p.m. this Sunday, Oct. 5. Presented by the Friends of Barclay Farmstead, this month's tour will include a free craft activity from 1 to 3 p.m., where guests can make their own beeswax candle. Beeswax, made by honeybees, was one of the earliest materials used to make candles, dating back to Roman times. Beeswax candles burn slower, cleaner, and smell more pleasant than candles made from tallow or paraffin. Can't make it this weekend? The Farmstead will be open for tours on the first Sunday in November, as well. Tours are free for Cherry Hill residents. For more information, call (856) 795-6225, or email info@barclayfarmstead.org [mailto:info@barclayfarmstead.org] . 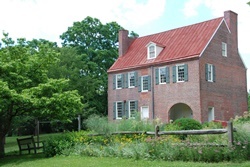 Be sure to follow @HistoricBarclay [https://twitter.com/HistoricBarclay] on Twitter, and the Barclay Farmstead Museum [https://www.facebook.com/pages/Barclay-Farmstead-Museum/194906327325322?fref=ts] on Facebook for information on upcoming events and activities throughout the year. Spreadsheet programs were developed to replace columnar pads. Learn why to use spreadsheet programs like Microsoft Excel, OpenOffice Calc and LibreOffice Calc, which are both free programs. In Part I of this 4-part course, learn how to organize and store data such as telephone numbers, addresses and credit-card information, how to use the built-in spreadsheet help information, and how to use spreadsheets in the workplace. Prerequisites: Basic Mouse and Keyboard Skills, some PC experience, or equivalent experience. Seating is limited; click here [http://host6.evanced.info/cherryhill/evanced/eventsignup.asp?ID=5935&rts=&disptype=&ret=eventcalendar.asp&pointer=&returnToSearch=νm=0&ad=&dt=mo&mo=10/1/2014&df=calendar&EventType=ALL&Lib=&AgeGroup=ALL&LangType=0&WindowMode=&noheader=&lad=&pub=1&nopub=&p] to register. Join us for this new four-week series introducing a new language. This October, let's learn Spanish together. We'll meet once a week to practice our new vocabulary with bilingual stories, songs and more! Remember to sign up for each week in the series. Click here [http://host6.evanced.info/cherryhill/evanced/eventsignup.asp?ID=5892&rts=&disptype=&ret=eventcalendar.asp&pointer=&returnToSearch=νm=0&ad=&dt=mo&mo=10/1/2014&df=calendar&EventType=ALL&Lib=&AgeGroup=ALL&LangType=0&WindowMode=&noheader=&lad=&pub=1&nopub=&p] to reserve a spot. Cherry Hill Education Foundation's "Cherry Hill-opoly" - a great keepsake! The Cherry Hill Education Foundation has created a new board game called "Cherry Hill-opoly"! The game will showcase the Township of Cherry Hill and the Cherry Hill Public Schools in the traditional Monopoly format that we all know and love. All proceeds will be used by the Foundation to fund grants that will benefit Cherry Hill Schools. Games are $40 each. You can order online at www.CherryHillEducationFoundation.com [www.CherryHillEducationFoundation.com] , or complete the order form on the foundation's website and return it as soon as possible. Games ordered by Oct. 15 are guaranteed to be delivered in time for the December holidays. Don't miss the chance to own what is sure to become a treasured keepsake! Click here for more information or to order [http://www.cherryhilleducationfoundation.com/CHEF/Events2.html] . On Tuesday night, several Cherry Hill residents turned out to learn how to prepare for emergencies of any kind during a special National Preparedness Month event in the Township's N. John Amato Council Chambers. Led by Cherry Hill Emergency Management Kevin Seta, the event was part of America's PrepareAthon 2014 [http://www.community.fema.gov/connect.ti/AmericasPrepareathon] , a nationwide initiative aimed at raising awareness of the importance of preparing. It capped off Cherry Hill's observance of National Preparedness Month 2014, and featured tips on staying information in the event of an emergency, how families can prepare their own emergency plans, and what you should pack in your "Go Kit" of supplies you keep on hand for emergencies. If you couldn't make it to Tuesday's event, don't worry: You can visit Ready.gov [http://www.ready.gov/] any time to learn more about how to keep your family safe all year long. To reach Officer Seta and the Cherry Hill OEM, email kseta@cherryhillpolice.com, or call (856) 432-8836. On Wednesday night, the Cherry Hill Board of Fire Commissioners formally appointed Thomas Kolbe to the position of Chief of the Cherry Hill Fire Department. Chief Kolbe was sworn in in front of family, friends, fellow fire officers, firefighters and Township officials, and his son, firefighter Christopher Kolbe, assisted in his badge pinning. Chief Kolbe is a veteran of the CHFD, and has been a full-time firefighter for 29 years. His career began as a volunteer firefighter in Cherry Hill in 1977, when he was just 16. Please join me in congratulating Chief Kolbe on his achievement. For pictures and more information, click here [http://cherryhillfire.blogspot.com/2014/10/chief-thomas-kolbe-takes-oath-of-office.html] . October is Fire Prevention Month, and the Cherry Hill Fire Department is kicking off a month of education and awareness with open houses at several fire stations in the Township. These events are an opportunity for Cherry Hill residents to visit their neighborhood fire house, speak with firefighters and EMTs, get an up-close look at the apparatus and equipment, and receive critical fire-safety information. Open houses are scheduled from 6:30 to 8 p.m. Tuesday, Oct. 7, at Station 3 (1100 Marlkress Road) and Station 6 (1501 Burnt Mill Road), and on Thursday, Oct. 9, at Station 24 (807 Route 70 West), Station 22 (951 Kings Highway North) and Station 5 (2328 Route 38). For more information, visit the Cherry Hill Fire Department's Facebook page [https://www.facebook.com/CherryHillFire] .